I will manually send a combined quote based on the new total weight. Marvel Comics Spiderman Venom Carnage Hobgoblin Mysterio . here it is: FLEER ULTRA SPIDERMAN PREMIUM 1996. 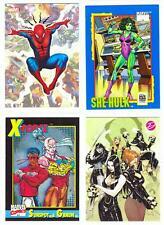 MARVEL LIMITED CANVAS TRADING CARDS 1,2,3,6 OF 6. MARVEL COMICS PROMO CARDS »Lot of 16 Mixed Promo Cards« This Lot Includes: »AVENGERS SILVER AGE (2015): #P1 »BLOODTIES (1993): Unnumbered Checklist Promo »CLANDESTINE (Marvel UK, 1993): Unnumbered Promo »DANGEROUS DIVAS 2 (2014): #P1 »MARVEL'S GREATEST BATTLES (2013): #P1 »MARVEL TRADING CARD TREATS (Impel, 1991): 4 different unnumbered promos (Captain America, Hulk, She-Hulk & Spider-Man) »MARVEL VS.
PETER PARKER SPIDER MAN. £1.50 per card or £3 for three cards! Peter Parker/Spider Man. THERE WILL BE COMPLETE SETS, PARTIAL SETS, SET BUILDING LOTS, PLAYER LOTS, TEAM LOTS, SINGLES AND MORE. SET BUILDING LOTS MAY OR MAY NOT MAKE COMPLETE SETS. UNLESS OTHERWISE SPECIFIED, EXPECT DUPLICATION. I JUST PICKED UP ANOTHER LARGE (MOSTLY MARVEL) NON-SPORT COLLECTION. THE COLLECTION CONTAINS DOZENS OF COMPLETE SETS, SET-BUILDING LOTS, INSERT/CHASE CARDS, AUTOGRAPHED CARDS AND MORE. SET BUILDING LOTS MAY OR MAY NOT MAKE COMPLETE SETS. 1994 Marvel trading cards Spider Man vs. Vulture Clear Cell sheet PROMO. THE AVENGERS: KREE-SKRULL WAR (Upper Deck, 2011)--Insert Lot #7: "Soldier's Honor" / 6 Cards This Lot Includes: »6 cards from the fifth story, "Soldier's Honor": #5-1, 5-2, 5-3, 5-7, 5-12, 5-18 All cards appear in the scans **FREE shipping in the USA** NM-MINT condition: --**SEE SCANS ABOVE** »NOTE: Other than the defects mentioned above--if any--any blemishes, scratches, dust or other visible defects are on the top-loader or plastic sleeve ONLY, not on the item shown »Foil, chromium, embossed and other enhanced cards can be difficult to scan. The card (s) you receive may look slightly different than in the image scans **Please ask any and all questions BEFORE bidding or buying. THE AVENGERS: KREE-SKRULL WAR (Upper Deck, 2011)--Insert Lot #5: "The Fall" / 15 Cards This Lot Includes: »10 cards from the third story, "The Fall": #3-2, 3-6, 3-9, 3-13, 3-16, 3-18, 3-20, 3-23, 3-24, 3-26 All cards appear in the scans **FREE shipping in the USA** NM-MINT condition: --**SEE SCANS ABOVE** »NOTE: Other than the defects mentioned above--if any--any blemishes, scratches, dust or other visible defects are on the top-loader or plastic sleeve ONLY, not on the item shown »Foil, chromium, embossed and other enhanced cards can be difficult to scan. The card (s) you receive may look slightly different than in the image scans **Please ask any and all questions BEFORE bidding or buying. 1994 Marvel trading cards Spider Man Master Print PROMO sheet. 2007 Marvel Masterpieces SKYBOX SPIDER-MAN CHASE INSERT 21 CARD LOT! MARY JANE! 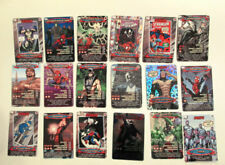 THIS IS THE AMAZING 2007 Marvel Masterpieces SKYBOX SPIDER-MAN CHASE INSERT 21 CARD LOT! MARY JANE! THIS CHASE CARD LOT IS ONE OF THE BEST AND HARDEST FIND OUT THERE OF THE MARVEL CHASE SETS. 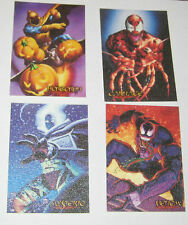 THESE CARDS FEATURE SPIDER-MAN ONE OF THE GREAT MARVEL CHARACTERS. THE AVENGERS: KREE-SKRULL WAR (Upper Deck, 2011)--Insert Lot #4: "The Debt" / 15 Cards This Lot Includes: »15 cards from the second story, "The Debt": #2-3, 2-4, 2-7, 2-9, 2-11, 2-12, 2-15, 2-16, 2-19, 2-23, 2-28, 2-29, 2-31, 2-32, 2-34 All cards appear in the scans **FREE shipping in the USA** NM-MINT condition: --**SEE SCANS ABOVE** »NOTE: Other than the defects mentioned above--if any--any blemishes, scratches, dust or other visible defects are on the top-loader or plastic sleeve ONLY, not on the item shown »Foil, chromium, embossed and other enhanced cards can be difficult to scan. The card (s) you receive may look slightly different than in the image scans **Please ask any and all questions BEFORE bidding or buying. THE AVENGERS: KREE-SKRULL WAR (Upper Deck, 2011)--Complete 27-Card "Retro" Insert Set This listing is for the 27-card "Retro" insert set (numbered #R-1 to R-27) featuring classic art by NEAL ADAMS, JOHN BUSCEMA & others! All cards appear in the scans **FREE shipping in the USA** NM-MINT condition: --**SEE SCANS ABOVE** »NOTE: Other than the defects mentioned above--if any--any blemishes, scratches, dust or other visible defects are on the top-loader or plastic sleeve ONLY, not on the item shown »Foil, chromium, embossed and other enhanced cards can be difficult to scan. The card (s) you receive may look slightly different than in the image scans **Please ask any and all questions BEFORE bidding or buying. THE AVENGERS: KREE-SKRULL WAR (Upper Deck, 2011)--Insert Lot #3: "Retro" Set -8 This Lot Includes: »"Retro" Insert set -8 cards (includes 19 of 27 cards) Missing cards: #R-1, R-6, R-8, R-10, R-11, R-12, R-12, R-19 NOTE: The scans represent the entire chase set; some cards that appear in the scans may NOT be included in the lot for sale **FREE shipping in the USA** NM-MINT condition: --**SEE SCANS ABOVE** »NOTE: Other than the defects mentioned above--if any--any blemishes, scratches, dust or other visible defects are on the top-loader or plastic sleeve ONLY, not on the item shown »Foil, chromium, embossed and other enhanced cards can be difficult to scan. The card (s) you receive may look slightly different than in the image scans **Please ask any and all questions BEFORE bidding or buying. This is a single insert card, VULTURE GOLDEN WEB #9 from 1995 FLEER ULTRA SPIDERMAN TRADING CARDS issue. VULTURE GOLDEN WEB #9. from 1995 FLEER ULTRA SPIDERMAN. I HAVE NO MORE PROWLER AND NOIR CARDS! Have limited supply of the following cards as they are very rare. 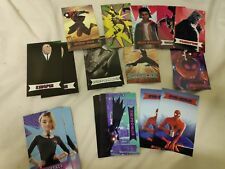 Kingpin x2 Spider-Man x6 Please make sure you let me know what card you want so I can update the listing. Can ship worldwide. Any questions please don't hesitate to contact me. Thank you. MARVEL MIXED INSERT LOT #3 »Lot of 31 Mixed Insert Cards« This Lot Includes: »HULK (2003 Movie): 1 Game Card Insert »CAPTAIN AMERICA: THE FIRST AVENGER (2011): Classic Comic Covers Insert #C-6 »MARVEL BRONZE AGE (2012): Poster/Puzzle Insert #PP17 »MARVEL MASTERPIECES 1994: Holofoil Insert #10 (War Machine) »AVENGERS ASSEMBLE (2012 Movie): Retail Sticker Insert #S29 »SGT. THE AVENGERS: KREE-SKRULL WAR (Upper Deck, 2011)--Insert Lot #2: "Retro" Set -4 This Lot Includes: »"Retro" Insert set -4 cards (includes 23 of 27 cards) Missing cards: #R-6, R-10, R-11, R-19 NOTE: The scans represent the entire chase set; some cards that appear in the scans may NOT be included in the lot for sale **FREE shipping in the USA** NM-MINT condition: --**SEE SCANS ABOVE** »NOTE: Other than the defects mentioned above--if any--any blemishes, scratches, dust or other visible defects are on the top-loader or plastic sleeve ONLY, not on the item shown »Foil, chromium, embossed and other enhanced cards can be difficult to scan. The card (s) you receive may look slightly different than in the image scans **Please ask any and all questions BEFORE bidding or buying. 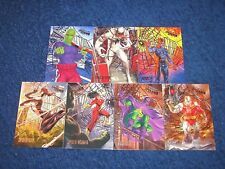 1994 FLEER ULTRA SPIDER-MAN SUSPENDED ANIMATION INSERT 11 CARD LOT! BLACK CAT! THIS IS THE FANTASTIC 1994 FLEER ULTRA SPIDER-MAN SUSPENDED ANIMATION INSERT 11 CARD LOT! BLACK CAT! THESE CARDS FEATURES BLACK CAT AND VULTURE BOTH GREAT MARVEL FAVORITES. YOU WILL GET ALL 11 INSERT CARDS IN THIS LOT! 2015 Upper Deck Marvel Vibranium Molten Parallel 227/299 MATCHING NUMBER LOT! These are the Marvel Vibranium. Molten Parallel Cards. and there were only 299 of each red Molten Parallel card produced ! These were the Molten Parallel card released by. trading cards from Upper Deck. Condition/Grade: NM, SEE PICS! Multiple art pages can easily be combined because they are light and thin. For instance, two statues require a much bigger box. A RUN will be a collection of consecutive issues with no breaks in between them. This is a single insert card, MASTERPIECES # 3 from 1995 FLEER ULTRA SPIDERMAN TRADING CARDS issue. from 1995 FLEER ULTRA SPIDERMAN. MASTERPIECES #3 of 9. This is a single insert card, MASTERPIECES # 2 from 1995 FLEER ULTRA SPIDERMAN TRADING CARDS issue. from 1995 FLEER ULTRA SPIDERMAN. MASTERPIECES # 2 of 9. A RUN will be a collection of consecutive issues with no breaks in between them. If it says RUN of #s 1 - 50 you will receive 50 consecutive comics. A LOT will be within a certain range, so a 50pc LOT will not contain consecutive books. 1990 Fleer Ultra 6.5x10" SPIDER-MAN ULTRAPRINTS Lot of 8 NM 9.4 Carnage Venom Condition/Grade: NM. This is normal in our experience. Multiple art pages can easily be combined because they are light and thin. COLLECTABLE CALENDAR CARDS X 6. fab XMAS GIFT IDEA ! The six cards you receive will be as my second scan. minus the DO NOT COPY words. ideal as GIFT. Reverse as my second scan. A Great Gift For Magical Adventure Fans. Any "cross-hatching" in the photo is from my crummy scanner, and not on the item itself. 1994 Marvel SPIDER-MAN ENEMIES Promo Cards Uncut 9 VF- LOT of 2 Slightly Different. Condition/Grade: VF-, SEE PICS! Multiple art pages can easily be combined because they are light and thin. For instance, two statues require a much bigger box. COLLECTABLE CALENDAR CARDS X 6. The six cards you receive will be as my scans. minus the DO NOT COPY words close up of four at my second scan. all 6 cards at my fourth scan. ideal as GIFT. close up of one card at my first scan.